Cyclone 'THANE' ravaged Tamil Nadu & Puducherry inundating cities, towns and villages. Chemplast Sanmar's PVC Plant at Cuddalore withstood the severe winds that blew with a speed of over 140 kmph. In the aftermath of the floods, Chemplast Sanmar helped the district administration by providing drinking water from its desalination plant to the local community. Chemplast also distributed rice and food packets providing means to a square meal till the waters abated in the villages around Cuddalore. 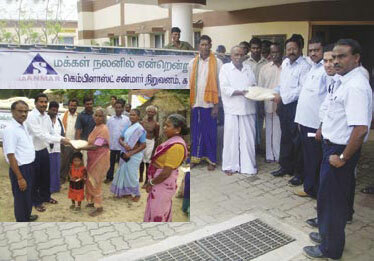 Chemplast Sanmar provided financial aid for the renovation of a local temple around its Cuddalore plant.